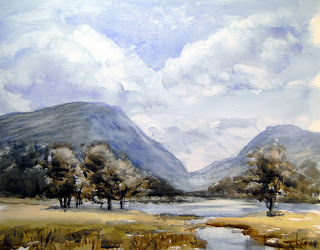 This is another large rough brush painting of Derwent Water. My wife and I walked all the way round it (10.5 miles) Took plenty of photographs to use as reference for my painting. Thought I had better show a lake district painting with a lake in it! Used Ultramarine, Burnt Umber, Alizarin Crimson, Sap green, yellow ochre. Also experimented using ox gall to help form clouds. I will probably make a video tutorial of cloud painting soon. The ox gall is what they call a 'wetting agent' how does water get wetter?! Actually the effects can be quite interesting because it helps prevent run backs and the infamous 'watercolor cauliflower' effect.